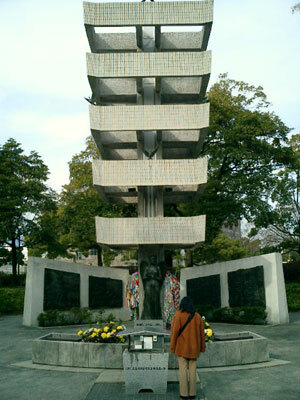 I was a 14-year old high school boy at the time of the atomic bombing. Students at that time were mobilized to tear down certain houses to make firebreaks in the city. I was 1.7 kilometer (1 mile) from ground zero on the morning of August 6, 1945, so I suffered many serious burns on my face and hands, which left large scars known as keloids. On the same day, my mother was killed by the bomb as were many of my friends and teachers. All these sorrows came to me all at once. I was suffering and ashamed of my keloid burns all the time, and I did not know how to make a living. I felt like shouting at the top of my voice in despair. But I could only murmur, “If only the A-bomb had not been dropped!” I was completely overwhelmed with grief, which resulted in the autism from which I suffered for a long time after the war. 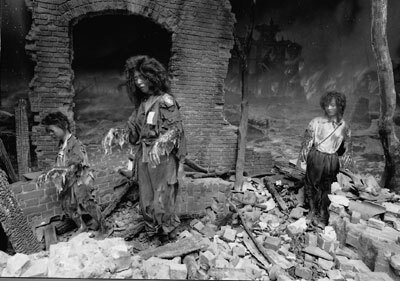 *Wax models in the Hiroshima Peace Memorial Museum portray a common scene on August 6 and thereafter the ghostly appearance of burn victims holding their hands away from their bodies, stumbling along in a painful daze [and] with little sense of direction. Thinking of this sudden change of fate at the moment of the bombing, as if we were thrown into a smelting furnace — lots of people wandering with their skin hanging, piles of dead. Swollen and burnt bodies, and my relatives and friends dying while vomiting blood or something like black foam – I strongly felt that we who survived the atomic bombing should do something for those suffering so much, and should appeal to the people everywhere to understand the disaster that befell Hiroshima so that it might not ever be repeated. It was my earnest desire to do something for peace, but I was suffering from tuberculosis. At the same time, what with the Korean War breaking out and with nuclear bombs still being developed, I became very fearful. I wrote about my A-bomb experiences, composed poems about the A-bomb, and wrote to newspapers to request help for the victims. When I had almost recovered from my injuries, I went to school again so that I could become a school teacher. After becoming a teacher, I often felt gloomy because of the students’ gaze at my ugly keloid scars, while I was consciously trying to forget about the A-bomb. Thus I was at a complete loss when asked, “What do your students who had no experience of bombing think of the A-bomb?” After all, just ten years after the bombing, there were many students who had had no experience of war. I was awfully ashamed to acknowledge the fact that I had not had any objective talks with the students about the atomic bombing. I personally felt peaceful only when I forgot about the ugly keloid scars on my face, and the misery of the bombing. I began to realize that I was always trying to avoid any talk of the A-bomb. Should that misery be forgotten? Should we not foster in young people a will toward peace that can help avoid the same blunder again? If we have another nuclear war, even those inexperienced youths will not escape it. There is no guarantee that these youths would survive it. Therefore they also have some responsibility to prevent war. Even now countless A-bomb victims are suffering from various diseases and, moreover, they are subjected to great anxiety over whether radiation affects the second generation, as is indicated by experiments with animals. Accordingly, the youths, second-generation survivors, are apt to be discriminated against in employment and marriage. These problems should be solved by youths with their own understanding and sense of public responsibility. I have tried to inform students about the terror of the A-bomb. For example, I wrote a drama titled “Hiroshima” based on the A-bomb disaster, involving death and suffering among mobilized students and children. I have exhibited A-bomb pictures and panels on loan from the A-bomb museum. I had students read articles and poems about A-bomb experiences. We have discussed nuclear weapons in our school club. I have joined a peace mission group traveling throughout the world, appealing to people everywhere for understanding of the A-bomb experiences. However hard I tried, statistics show that the number of young people who do not know about Hiroshima, or are forgetting, is increasing. This is only natural, for as the saying goes, “Out of sight, out of mind.” But I am most surprised by current school textbooks. Only a few lines are given to the A-bomb experience: “On August 6, 1945, an atomic bomb fell on Hiroshima and the war ended with Japan’s acceptance of the Potsdam Declaration.” As the years have passed, school text treatment of the atomic bombing has been persistently pared down and simplified. It is well known that the Ministry of Education has imposed these limitations on school textbooks. I have felt helpless when realizing that there is little use in trying to bring about peace only by individuals or voluntary groups. Since the abolition of war and of nuclear weapons has much to do with international affairs, I believe peace education must be promoted and carried out internationally.